The warm, golden-brown color of kraft paper dappled with fiber flecks and specks give Elements Kraft a rustic, homemade feel. In addition to the old-school original kraft color, this style is offered in soft red, blue or grey. And to let you get extra crafty, there are loads of fonts to choose from for a truly customized look. Customize your Elements Kraft Mother's Day Coasters today! Elements Kraft Mother's Day coasters are available in multiple shapes—3.9" round, or 3.9" square with rounded corners, and others. They are extra-thick, 58-point paper board. To give you just an idea of how thick they are, a stack of a dozen coasters is about 3/4" tall. They are made of an absorbent pulpboard to help protect your tabletops. The coaster surface is also coated with a smooth matte coating to provide beautiful, crisp printing. 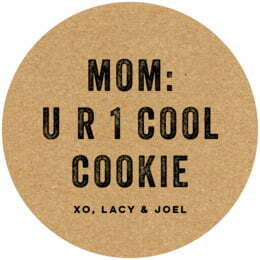 And Evermine Mother's Day coasters are individually die-cut, so their top has a soft and rounded edge. Elements Kraft Mother's Day coasters are printed on one side only. On the blank back, a small Evermine logo is tastefully debossed (not printed with ink, but simply pressed into the soft pulpboard paper). They come beautifully packaged in boxed sets of a dozen; they are a great item to bring as a gift to celebrate everything about Mom and to provide a cherished memory. 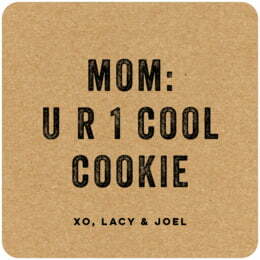 Just click on the "Personalize" button to get started customizing your Elements Kraft Mother's Day coasters today!